Now for the first time anywhere, he reveals just how he did it! I like these "how to" kinds of guides because even if you don't want to make your own volcano without the prospect of baking soda blowing up in a high school science fair, the techniques used are applicable to all kinds of things you might want to try. Many thanks to MMI for putting this together. Click on any image to see it at the larger, original size. If you have kudos, questions, or comments (wow, alliteration with three totally different letters, score!) for MMI, please let him know in the comments. I just read this over again and realized how poor my grammar was! Oh well, it still gets the important idea’s across. MM+I- Thanks for sharing this with us. That volcano was awesome. Very creative and a really striking visual. Great job! Good job MMI. Don’t worry about the grammar,I have to have Isia edit mine all the time. 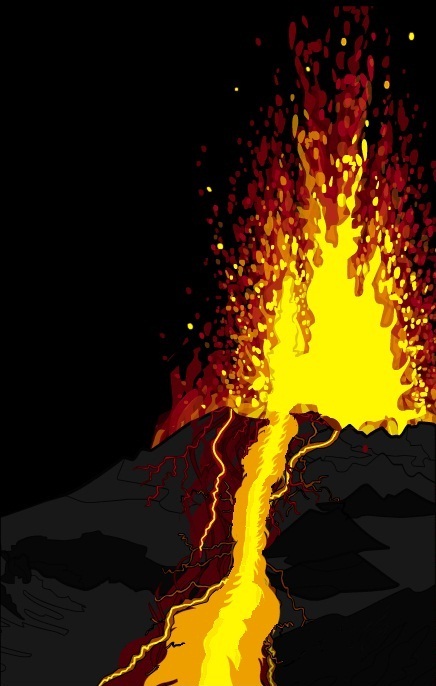 Using lightning for lava = brilliant. I liked this one very much. I had figured out how to do lot of it but, I will admit I couldn’t figure out how you did most of the lava flow itself. Very nice. The backgrounds are fabulous; I love them. When I was saw the ocean wave I struck with wanting to make a mermaid. I saw satyr legs, but what about the other human hybrids like merfolk and centaurs and such. Absolutely brilliant! You did an incredible job! I agree with my esteemed colleagues. This was inspired work. Gee, you’re all going to make me blush! It is nice to know that my efforts were well appreciated. Hopefully this recipe helps give a few more ideas to people for how to accomplish what they want to. Lithorn (#7: Those are located in the “Body-Monster” set. Load the Body-Standard you want, either male or female. Choose just the torso, with no legs. Then load the “Body-Monster” set, click the “multiples” option, and pick the body bottom you want. There’s a snake, mermaid, satyr, octopus, three horses, a tree, a spider, a ghostly trail, a robo-crab, a robo-spider, a tornado, a robot floater, sea serpent, feline, cougar, bird, rock crab, and motorized tread you can select.